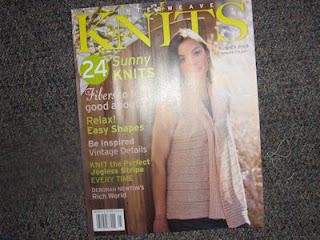 I sure hope there are a few good articles in this issue... because there sure are not any patterns that I like. I shouldn't have purchased it! Knitting. Yes. I still knit. On Sunday, I overheard someone at Maryland Sheep and Wool say that she was "wrap obsessed". I'm so glad I'm not the only one. 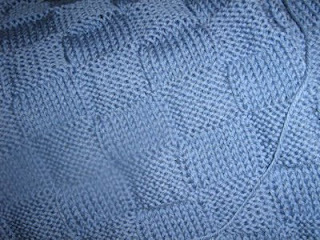 Below is my second basketweave wrap made with Kraemer Yarns Summit Hill - worsted weight washable wool. I love this yarn. It's so cozy. My green basketweave wrap is really my "go to" wrap. I keep it on my bed in the winter and grab it when I get up. It's warm and large and it just feels great to wrap up in it. This one will look great with jeans for chilly summer nights. I thought I'd do a summer top for something different. 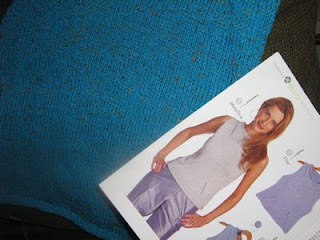 This yarn is Kraemer Yarns Tatamy Tweed which is a mixture of cotton and acrylic. 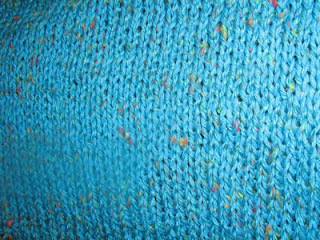 I've made other projects with this yarn and it's great too. In fact, all Kraemer yarns are nice and they're made right here in Pennsylvania. I love their Alpaca yarn too. We'll see if it fits. 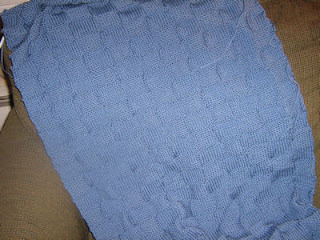 For as much knitting as I do, I haven't had much success in knitting things that actually fit. I guess that's why I'm so "wrap obsessed" !